If you plan to return to a location, such as a hotel or city, creating a dialing location in Windows saves time when you need to use your laptop’s dialup modem. Open the Phone and Modem Options icon in the Control Panel. The Phone and Modem Options dialog box has three tabs: Dialing Rules, Modems, and Advanced. The first question you’re asked the first time you open this icon is to enter the main location. After you fill in that information, the Phone and Modem Options dialog box appears, as shown above. 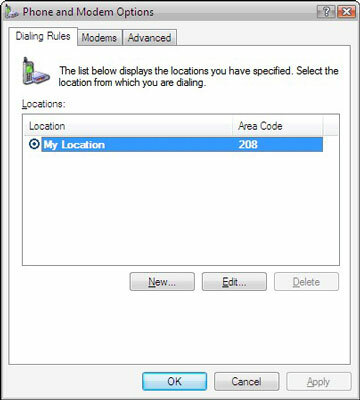 The Dialing Rules tab is used to list the locations where you use your laptop. Highlight the My Location item on the Dialing Rules tab. If you’re just starting out, My Location is the only location. Later on, as you create locations, you can use these steps to modify them in case you ever visit that spot with your laptop again. The Edit Location dialog box appears, where you can customize the way the modem dials the phone, depending on your location. Enter a name for your current location. For example, enter Home or The Office or wherever your laptop is right now. Select whichever country you’re in now. Fill in the Dialing Rules area. You can leave these items blank if none is required. If your hotel requires you to dial an 8 before making a local call, and a 9 for making a long-distance call, put those numbers into the appropriate boxes. 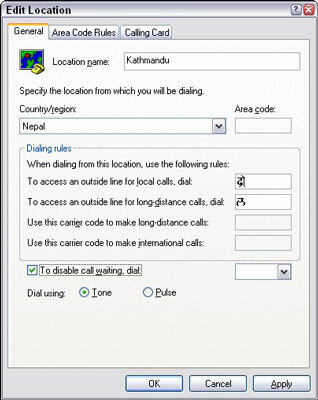 To disable call waiting while the modem is online, select the To Disable Call Waiting Dial check box. Then select the proper code sequence from the drop-down list. The call-waiting signal disconnects an active modem connection. You select this box to disable call waiting on a per-phone-call basis. Finally, select whether your connection requires tone or (the antique) pulse dialing. You need to select the Pulse option only if your area is limited to pulse dialing; otherwise, you can choose Tone. Windows uses this information whenever you use the modem.